Sports Illustrated's 'Where Are They Now' feature jumps into the wayback machine and lands in Milwaukee this week with a look at one of the most memorable teams in the history of college basketball, the 1977 Marquette Warriors. You know, that Bernard Toone vs. Al McGuire episode never gets old. 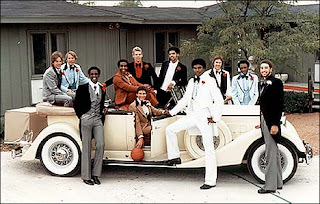 Nor does that shiny championship trophy, MU's sublime second half run, the picture of Bo piercing through the net at the Omni, or the photograph of this one-of-a-kind team decked out along side a classic car. The article, which will appear in the July 2 issue of the hard copy, can be found here. In looking at the present-day vocations of these fellas you'd have to say that this truly is one special group of guys. you heard it here first. Coach Rab won't be back.